John (Jack) Samuel Deane was the sixth of thirteen children born to John and Pleasant Anne Deane. He was born on 28th July 1889. His parents were Irish and had come to Australia in the 1850’s eventually settling in the farming district of Mount Pleasant. As a lad Jack worked on the family farm, droving sheep and cattle to market. As he grew older he managed his father’s other farm at Rhine Villa. In 1913 he left Mount Pleasant to try his luck in the vineyard territory of McLaren Vale. He settled in the district, and became engaged to Linda Mudge. 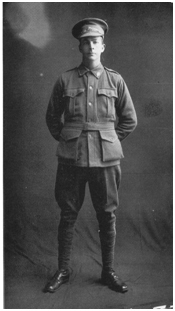 Jack enlisted at Adelaide on 1st March 1916. He was 26 years and 5 months old. He was a tall man of 5’9”, weighing 129 lbs, with brown hair and blue eyes. He listed his religion as Church of England. He left Australian shores at Outer Harbour aboard the “Seang Bee” on 13th July 1916 to arrive in Plymouth England later that month. After some basic training at Codford (and one night Absent Without Leave for which he was docked one day’s pay) he left Folkestone in November aboard the “S.S. Victoria” and sailed to Etaples, France. By 9th December he had joined his unit and been appointed Lance Corporal. His Statement of Service then provides very little detail, simply stating that by April 1917 he was reported as Missing in Action. By the end of December 1917 he was now reported as Killed in Action in the Field. From letters he had written to his family it was believed he had been in the trenches at Bullecourt. The story has been well repeated by members of the family of his father’s dream that “he had just seen Jack blown to pieces”. This was followed soon after by the horrible official news that Jack had stepped on a mine. Red Cross reports simply confirmed his death. Mourning families gathered at St. John’s Anglican Church, Mount Pleasant in March 1918 to hold a memorial service for Jack. He had been very popular and was also quite a joker. His fiancé Linda never married.